More and more, extraordinary weather events are becoming the norm in Westchester County. Nor’easters, tropical storms and severe thunderstorms have deluged Westchester with greater frequency and intensity. Some recent and memorable weather events were the late winter/spring 2007 storms, especially an April nor’easter that dumped up to nine inches of rain on southern Westchester just as residents and business owners were recovering from a large storm only weeks earlier. In late summer of 2011, Hurricane Irene and Tropical Storm Lee hit the region within 10 days of each other, dropping a total of nearly 11 inches of rain. Superstorm Sandy, in October of 2012, while not resulting in significant rainfall still caused extreme coastal flooding from storm surge and high winds. Chronic flooding from short-lived but intense thunderstorms throughout the county causes localized but significant flooding, where roads become impassable, stormwater enters homes, and lawns become ponds. To lessen the risks associated with flooding on residents and businesses, the county is leading several efforts to better understand ways in which flooding can be controlled, to educate the public and municipal officials about flooding and flood mitigation, and to implement projects that will lessen the degree of flooding. The county also has partnered with other governmental entities to leverage its efforts. The Army Corps of Engineers re-studied flooding along the Saw Mill River in Greenburgh and Elmsford that led to its 2002 “Project Management Plan (PMP) for the Saw Mill River at Elmsford and Greenburgh, New York.” Read the report. The Army Corps of Engineers is also re-studying flooding in the Village of Mamaroneck and revising prior plans for a diversion tunnel to include a wide variety of cost effective measures to reduce flooding throughout the village. Visit the project website. The county enacted a Stormwater Management Law in 2011 requiring the county to assess current conditions and identify cost-effective projects to directly address flooding and flood damage and impacts in Westchester communities. The assessments, which include information provided by local municiplaiites on flood-prone areas, are documented in stormwater reconnaissance plans prepared for each of the major drainage basins. County projects to lessen the risks and impacts associated with flooding are also guided by these plans. A Stormwater Advisory Board created under the law began meeting in 2012 and is advising the county on flood-related matters. The county has been incorporating stormwater management into its infrastructure and building improvement projects, where applicable, including practices to detain and absorb stormwater runoff. Examples include improvements to sections of the Bronx River Parkway and parking lot reconstruction at the Westchester County Center. It also has partnered with other governmental entities to leverage its efforts, largely through grants, to install stormwater practices at other county and municipal facilities. View completed stormwater management and natural resources restoration projects. The county has developed a manual for elected officials, planning and zoning board members, planners and development professionals to improve land use decisions with respect to flooding and flood damage. The manual, titled “Flooding and Land Use Planning: A Guidance Document for Municipal Officials and Planners,” covers topics such as flooding causes, the relationship to development, regulations and site plan review tools. View the manual and PowerPoint presentations from a compendium workshop (Land Use Regulations and Floodplain Management, Floodplain Management Tools and Techniques, The Role of Planning in Watershed Management, and Using Site and Subdivision Review to Reduce Flood Damage). The Department of Emergency Services provides assistance to residents and municipalities and information about severe weather. Natural hazards such as severe weather impact everyone, and it is imperative that we all understand the risks and be prepared. In 2014 the county began the development of a countywide all hazard mitigation plan to address a variety of natural and manmade hazards. Forty-two Westchester municipalities signed on to the plan, which describes the hazards studied, evaluates vulnerability to those hazards, assesses risk and includes specific mitigation strategies to reduce risk and increase resiliency for the county and each participating municipality. In August 2015 the draft plan was submitted to FEMA and the New York State Division of Homeland Security and Emergency Services, which must review the plan and determine it is approvable. Once that is achieved, each municipality must adopt the plan before FEMA will issue a formal approval of the plan, making those municipalities eligible for many federal grant programs. More information on hazard mitiagation planning and a copy of the hazard mitigation plan can be found online. The Federal Emergency Management Agency (FEMA) updated the Flood Insurance Rate Maps for Westchester in 2007. Additional updates for coastal areas will occur during 2015. To find out more information about the flood maps and whether your property is in a designated flood zone, go to flood zone mapping. For more information on flooding and severe storms, visit the following sites. To find out about severe storms and how to prepare for them, visit the county’s Keeping Safe in Severe Weather website. Some helpful information on how to prepare and recover after a flood is available on the FloodSmart.gov website and on cleaning up your home after a flood at ImproveNet.com. Remember to contact your local building official before doing any demolition or reconstruction. To find out more about flooding, what you can do to reduce flooding and flood damage, and the National Flood Insurance Program, visit www.floodsmart.gov. There you can learn about the cost of flooding, find information on what to do before, during and after a flood and download checklists to help property owners protect their homes and businesses. For specific information about coastal flooding issues, visit the FEMA Region 2 website. 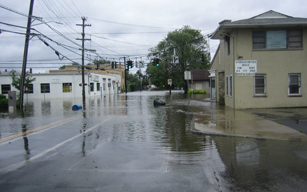 The New York State Office of Emergency Management has resources and information on flooding. The New York State Department of Environmental Conservation has links to resources on flooding and floodplain management.